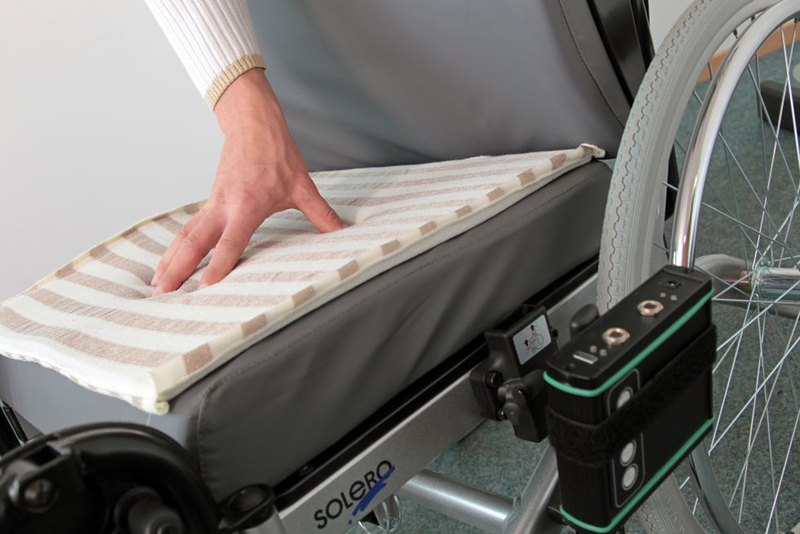 Anyone confined to a wheelchair or a bed has to deal with numerous complications. Frequently, they suffer from bedsores or decubitus ulcers as physicians call them. Bony prominences, such as the sacrum, coccyx and ischium, are especially endangered spots. Unrelieved pressure can lead to tissue necrosis. Damage can extend into the periosteum and, at the worst, into bones themselves. The ulcers are entryways for germs, which can trigger sepsis. While hitherto available passive aids such as air, gel or vacuum cushions relieve pressure, they do not relieve the affected area optimally. Some patients are also unable to actively control the distribution of pressure and alleviate their own suffering. They are dependent on others for help. Personal care assistants or family caregivers must constantly keep an eye out for the formation of pressure ulcers. A newly developed sensor mat will take over this job in the future and thus prevent tissue damage: Researchers at the Fraunhofer Institute for Factory Operation and Automation IFF in Magdeburg are endowing textile cushions with the capability to “feel” by outfitting them with smart sensor systems. pression of a single cell varies the voltage and produces an electrical impulse. Measurement electronics connected to the sensor system analyze the data in real time, evaluate them and regulate air cushions located beneath the sensor system. If, for instance, the sensors indicate that the pressure to the rear right is too high, then air is let out of the cushion at that spot – the cushioning is modified flexibly and selectively. While comparable sensor mats already exist, they are so expensive to manufacture that they are unsuitable for the mass market– a high resolution sensor mat costs several thousand euros. “Since all the materials we use are inexpensive, we can already produce single items for a few hundred euros,” says Woitag. Another advantage is that the weave of the textile employed is breathable and thus prevents moisture buildup. Present systems rely on film technology, which causes sweating. At around one centimeter, the sensor pad is so thin that it can be integrated in existing applications without any problem. A mat has been prototyped in various shapes and pressure resolutions. First, wheelchair users’ lives will be bettered. Then, the researchers intend to test the system in mattresses, too. In addition to the medical field, the experts are setting their sights on other fields of application: Drivers spend long hours behind the wheel and therefore often suffer from back problems. When integrated in truck seats, the sensor mat will provide drivers more comfort and help prevent postural defects. The prototype has already been produced. The researchers have recruited several industry partners, Isringhausen GmbH, warmX GmbH, Rehability GmbH and the Gesellschaft für Biomechanik Münster mbH, which are providing them support for their project.